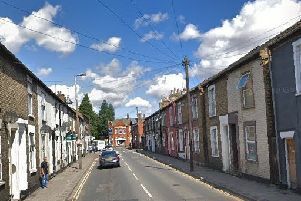 Work on Hitchin Road in Fairfield has been halted after workers came under ‘horrendous’ abuse from motorists. The work had been planned to start on Wednesday with a finish date of Sunday. But the roadworks was stopped after plans to allow a permitted left turn out of Dickens Boulevard was considered unsafe. The works are part of an ongoing project for a new school on Hitchin Road. A new scheme will be put in place from December 3, with the road totally closed between Dickens Boulevard and Eliot Way except for school buses and emergency vehicles. It will reopen by 4pm on Friday, December 7. All residents leaving Dickens Boulvard will only be able to turn right towards Letchworth. Traffic from Eliot Way will turn left and residents of Kingsley Avenue also can turn left. Public buses will also have to use the diversions. The statement said: “It is simply not safe to allow such a regular disruption by allowing public buses through the closure throughout the day to the works and therefore risks to the operatives.